Important films showing in Lydney – please come! Renowned international documentary film maker Pradeep Indulkar is coming to the Forest of Dean to show and talk about his latest films, High Power and Jaitapur Live. Pradeep was a qualified nuclear engineer who was so alarmed by what he saw happening in the nuclear industry that he became an anti-nuclear activist. In the film High Power he exposes the suffering of the people living near the Tarapur Nuclear Power Project, the largest nuclear power plant in India. The reactors have been condemned as dangerous by nuclear watchdogs, being of the same type but older than the Fukushima reactors that failed so catastrophically in Japan in 2011. 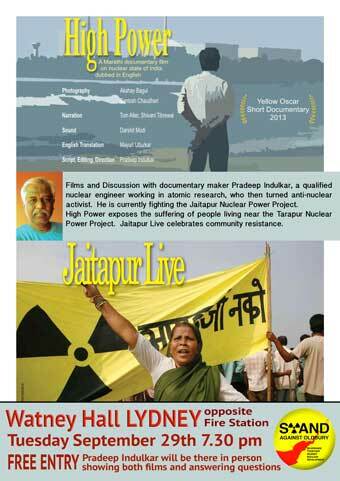 In Jaitapur Live, Pradeep follows the protest movement against the building of what is planned to be the largest nuclear power plant in the world, at Jaitapur. Protestors say it will destroy the extraordinary ecosystem in the coastal Konkan region of Maharashtra and displace thousands of villagers from their homes. It will also be a safety threat, being built, like Fukushima, in an earthquake zone and threatened by tsunamis. The planned reactors are to be of the new, and as yet untested, EPR type, built by the French state owned company Areva, that have run into construction problems, delays and cost over-runs in Flamanville in France, and in Finland. This is the same type and company that are to build the new Hinkley nuclear power station in Somerset, so Pradeep’s film is very relevant to the nuclear controversy raging here in the UK. Pradeep Indulkar will be showing both films at the Watney Hall, Lydney, on Tuesday September 29th at 7.30 pm. There will be a chance to discuss the films with their maker afterwards. Watney Hall is located at 3 The Hill, Lydney High St, (opposite the Fire station). No entry fee, but donations gratefully received to help support Pradeep’s tour around the UK.